A technique for the handset antenna field combining a PIFA and a slot in presented. 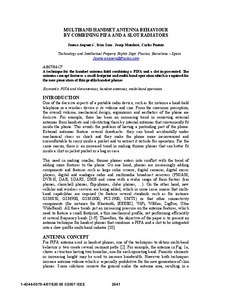 The antenna concept features a small footprint and multi-band operation which is required for the new generation of thin profile handset phones. Anguera, J. [et al.]. Multiband handset antenna behaviour by combining pifa and a slot radiators. A: IEEE International Symposium on Antennas and Propagation. "2007 IEEE Antennas and Propagation Society international symposium: Honolulu, HI, 9-15 June 2007". San Diego: Institute of Electrical and Electronics Engineers (IEEE), 2007, p. 2841-2844.